Noone holds Chrystia Freeland in higher esteem than she does. When she was the Financial Times correspondent in Moscow, she would react to correction or criticism by screaming down the telephone receiver. That’s when, among her fellow reporters, she picked up the Hysteria Freeland handle. That also is the assessment, according to two people familiar with the matter, of Canada’s new prime minister, Justin Trudeau, when he decided to drop Freeland from each of the cabinet portfolios she had proposed for herself, naming her instead Minister of International Trade. Since Trudeau’s Liberal Party won the October 19 election, Freeland has been promoting herself through the hometown Toronto press for finance minister, or for what the Toronto Globe & Mail was predicting to be “a very very big role” and a “dominant economic portfolio.” Instead, she was named to the ministry ranking 13th in the cabinet protocol. Among the women Trudeau appointed this week to his gender-equal cabinet, Freeland came a distant fourth. 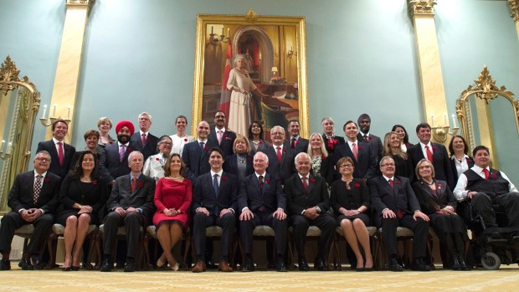 Outranked by the women and men to her right and left, Freeland took the seat on the Prime Minister’s right for the official cabinet photo: Two other economic policymakers who have been appointed above Freeland – President of the Treasury Board Scott Brison and Minister of Economic Development Navdeep Singh Bains were obliged to stand behind her in the second row. Freeland also employed the Nancy Reagan ploy of being the only woman to wear red (without the matching shoes). Last month, in a redistricted riding (constituency) of Toronto which has been home to university students and some of the wealthiest Canadian families, Freeland polled 27,806 votes, ahead of her NDP opponent with 15,969. Proportionally, Freeland’s vote of 49.8% was ahead of the national result for the Liberal Party of 39.4%. The defeated Conservative Party, which polled 31.9% nationally, drew only 17.5% in University-Rosedale. Jennifer Hollett, the candidate of the New Democratic Party (NDP), which had held the district in the old boundaries between 2006 and 2014, outpolled her party’s national score with 28.5%. Of the 1.2 million Ukrainians reported to be living in Canada, about 10%, or 122,000, live in Toronto and its surrounding metropolitan area. In Toronto city itself, the last count was 52,205. A closer look at the map of the Ukrainians in Toronto shows they aren’t constituents of Freeland’s. They live well to the west and to the north of her riding, so they cannot have voted for her even if they wanted to. A Census report of 2013 reveals that only 280 residents of Freeland’s constituency claimed Ukrainian as a mother tongue; only half that number claimed to be able to speak it still at home. That compares with 795 Russian-speakers, 1,245 Arabic speakers, and almost 9,000 speakers of the main Chinese languages. Freeland’s backing for the US and NATO wars against Russia, Syria, and China represent her personal convictions, not her constituents’. Ahead of last month’s poll, the Conservative Party government of Stephen Harper had offered Ukrainian-Canadians and their homeland relatives a great deal of cash to buy votes . For details of the C$400 million in near-interest-free loans to Kiev, military supplies, and special trade concessions for Ukrainian-Canadians, read this. Yesterday, a Toronto newspaper reported that before the election Freeland had been critical of the Harper government, and “was outspoken about Canada’s role in supporting Ukrainian independence and supported making it easier for small Canadian companies to do business abroad.” How much more Freeland plans to do for Ukraine on the trade front that Harper’s trade minister, Ed Fast, didn’t do is not yet clear. 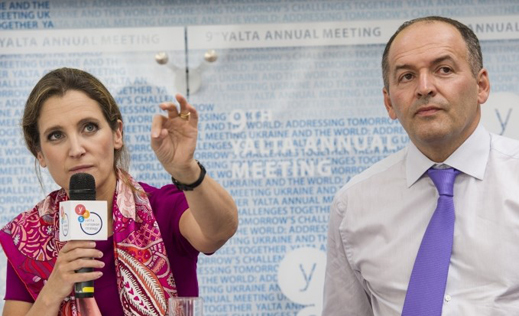 Now that she is minister in charge of Canada’s imports of Ukrainian steel, Freeland will be asked to consider duty-free treatment for the pipes produced in Dniepropetrovsk by Ukrainian oligarch, Victor Pinchuk (below, right). 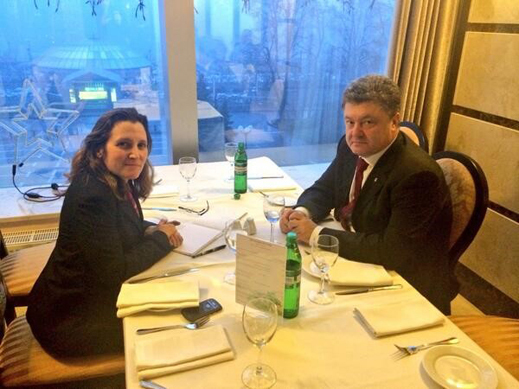 Before her election to parliament, Freeland had been a beneficiary of Pinchuk Foundation spending for several years. 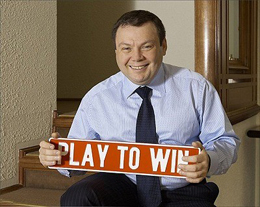 In 2003 Freeland had arranged a similar lunch for the Russian oligarch, Mikhail Fridman(right). Here is the story from the kitchen on that occasion. As the new trade minister, Freeland will be obliged to choose publicly between the domestic steelmaking jobs a Russian-owned Canadian pipemaker says are at risk, and Pinchuk’s Ukrainian pipe exports, which are undercutting the Canadian production. 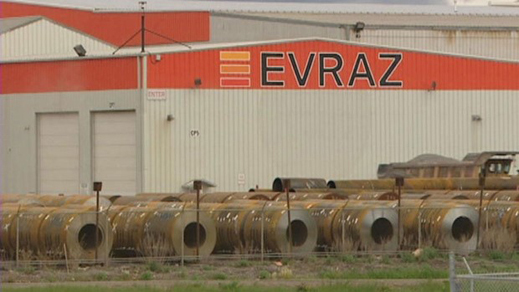 Here is what happened when the Canadian affiliates of Russian pipemaker Evraz and Tenaris of Argentina filed anti-dumping claims against imported pipes, including Pinchuk’s, charging they were being sold below their cost of production. “In consideration of the current situation in Ukraine,” officials at the Canada Border Services Agency (CBSA) gave Pinchuk and the Kiev government extra time to defend themselves. Their responses, according to the Ottawa report released on December 18, 2014, proved to be “less than complete”. Interpipe was found to be exporting to Canada both directly from Ukraine, and indirectly through the US. The US branch of Interpipe was then charged by CBSA with taking a 9.9% subsidy on production cost, and re-exporting to Canada with a dumping margin of 8.7%. It was hit with a penalty duty of 18.6%. Direct exports to Canada from Interpipe in Dniepropetrovsk were judged to be dumping at a margin of 53.2%; the import penalty was a prohibitive 63.1%. So long as Pinchuk routes his pipes through the US, before exporting them across the Canadian border, it looks like he might be off the hook. “Provisional duties related to the subsidization of goods from the Philippines, Thailand and Ukraine will no longer be collected, and all amounts collected during the provisional period will be refunded,” reads the official CBSA announcement. Speaking off the record, though, a CBSA official says the government has decided going forward there will be no relief for Interpipe. If Pinchuk is to move his pipes across the border, whether from his warehouse in Texas or from the factory in Dniepropetrovsk, “the penalty duty will be the same – 37.4%.” The practical effect, the official concedes, is no trade from Ukraine. So if Pinchuk asks, is Freeland a free trader or a protectionist? Answering that question yesterday, Canada’s Financial Post was sceptical that Freeland will do in private what she says in public. South of the border, for the story of Pinchuk’s lobbying of Hillary Clinton to exempt his Interpipe business from anti-dumping penalties there, read this. US law requires Pinchuk to register his $40,000 per month lobbying arrangement. A search of the Canadian lobbying records has turned up no trace for Pinchuk, Interpipe, or Ukraine. Freeland’s reports to parliament of her expenditures, including travel, don’t identify her foreign destinations. Canadian political analysts have yet to assess what impact the war in Ukraine, and the larger campaign for regime change in Russia, is having on Canadian public opinion and government policy. A countrywide poll of voters in September didn’t ask what Canadians think of the conflict in Ukraine, or of the Harper government’s regime-change rhetoric against Russia. But large majorities appeared to oppose spending more on the military at home or on combat preparations abroad. Almost half the Liberal voters were in favour of pulling the Canadian military out of Iraq and Syria. More than three-quarters of Canadians said they preferred a two-state solution between Israel and Palestine over an alliance with Israel. NOTE: Siklebaum Disease is a malady to which politicians are susceptible when they don’t mean what they say. Voters are acutely sensitive to the symptoms and react by stoning the victims to death, politically speaking. For a recent clinical case in Polish, then European public life of Radoslaw Sikorski and Anne Applebaum, open this archive.